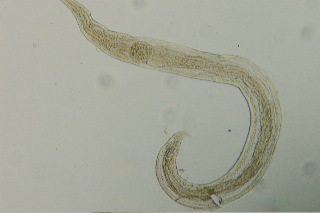 The Atractidae is a family of nematodes (roundworms) that are found in the intestines or lungs of various vertebrate animals. Instead of producing eggs, the adults produce larvae that are ready to infect as soon as they leave their mother's womb. While it is well-known that a host already parasitised by an atractid nematode can infect themselves again thanks to the infective larvae, it was not entirely clear how this parasite get passed between different hosts. The larvae of many parasitic nematodes infect their hosts through being accidentally swallowed, usually while their hosts are feeding (this is commonly how mammalian herbivores like sheep, cattle, and horses become infected). However, when these scientists tried to do the same with C. penneri larvae by pippetting larval worms down the lizards' throats, none of the larvae were successful in establishing in the host. Instead, they found the feces of anoles that had been fed parasite larvae were full of dead worms - presumably they were killed by gastric acid. Indeed, the environment in which C. penneri is usually found, down in the lower intestine, is pretty benign comparing with the acidic milieu of the stomach. But when they pipetted larval C. penneri into the cloaca of the lizard, it worked every time. Instead of having a separate opening, lizards have a cloaca - a common opening for their intestinal, urinary, and reproductive tracts. When lizards mate, they bring their cloacae together - and this is when C. penneri gets transmitted. Yes, that's right - C. penneri is a sexually transmitted infection. The study we are featuring today is one of the more difficult, yet under-appreciated type of studies in ecological parasitology; working out the life cycle of a multi-host parasite. Piecing together a parasite's life cycle is like conducting a forensic investigation into nature, which requires a lot of persistence and hard work gathering clues and putting together a picture from widely scattered jigsaw pieces. It is difficult enough working out a life cycle when the parasite in question lives in a relatively accessible habitat such as a lake or an estuary, but today's parasite, Prosorhynchoides borealis, is a fluke with a life-cycle that takes place far from shore in the sea off the southern coast of Iceland. We start this journey in a tiny clam (Abra prismatica) that lives buried in mud and sandy seabeds at depths of 15–164 metres in the sea off South Iceland. Prosorhynchoides borealis uses the clam for the asexual stage of its life cycle, and by that I mean it turns the clam into a little parasite factory that pumps out free-swimming larvae called cercariae. The researchers found that clams that are below a size threshold of 11 mm appear to be free of this parasite, but once they grow above that size, infection rates steadily increase and almost half the clams above 11 mm in size are infected. This resembles a pattern that has previously been found for other bivalve parasites (for example see this study and this study). 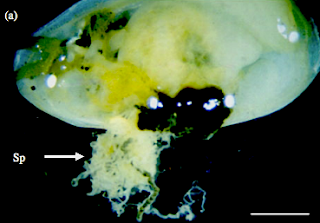 The asexual stages of the P. borealis are made up of interconnected, branching modules that extend throughout the clam's body like aggressive roots (see the picture above), invading various internal organs to draw out nutrients to fuel the production of hundreds of cercariae. 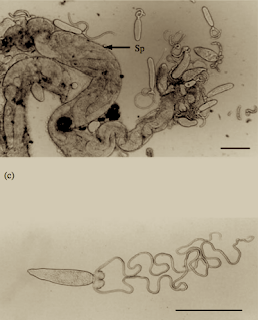 Extending from the back of each cercaria are a pair of long filaments that can reach more than six times the length of the cercaria itself (see the picture below). When they are released into the water, those filaments unfurl and fully extend and the cercaria resembles a "V" as it floats in the water. While it can't swim, it can use its tail to hang passively in the water, carried along by the current. In related species, scientists have observed the cercariae attaching to each other by the end of those extended filaments so that together they form a floating "net of cercariae". And why would they want to turn themselves into a miniature drift net? All the better to get tangled up in the gills of the parasite's next host - an unsuspecting fish cruising by in the wrong place at the wrong time. The next hosts of P. borealis are fish from the Gadidae family, which are also known as codfish. Once it gets under the skin of a cod, it migrates to the nerves and the brain cavity. There it grows and transforms into a stage called a metacercaria. But this is not even the parasite's final form; it needs to be eaten by an even larger fish to complete its life cycle. Gadids like cod, haddock, whiting, and pollock are generally fairly large fish, so if that is not the final destination for P. borealis, then the last host must be a pretty voracious predators that can eat a whole cod for lunch. Enter the monkfish Lophius piscatorius. Lophius piscatorius is a fish with a big mouth, big appetite and indiscriminate taste, and that suits P. borealis just fine. A monkfish has no trouble when it comes to eating a fairly sizeable cod as you can see in this video. In fact, it has little hesitation when it comes to dining on a lot of things, including the occasional sea bird. And it is in the intestine of this fish that the adult stage of P. borealis spends the rest of its life, nestled in a nutrient-filled highway of muscle and laying eggs that are carried out into the sea with the rest of the host's...waste traffic, where it can then go on to infect clams and begin the cycle anew. So if you have ever seen an unfortunate cod ambushed by a well-hidden monkfish, then what you just saw was not just a cod being eaten by a big ugly fish with an alarmingly large mouth, you have also just witnessed another few dozen P. borealis completing their life cycle.